If you can’t fix your Amazon Kindle, then please proceed to buy it here , you will help fund my reading hobby! Happy 2 years to my best friend, my companion through the loneliness and long travels! It is a very very happy day indeed because my best friend survived an ordeal that involved opening its cavity to the outside elements, removing major parts from the body and placing a transplant in place of the original. 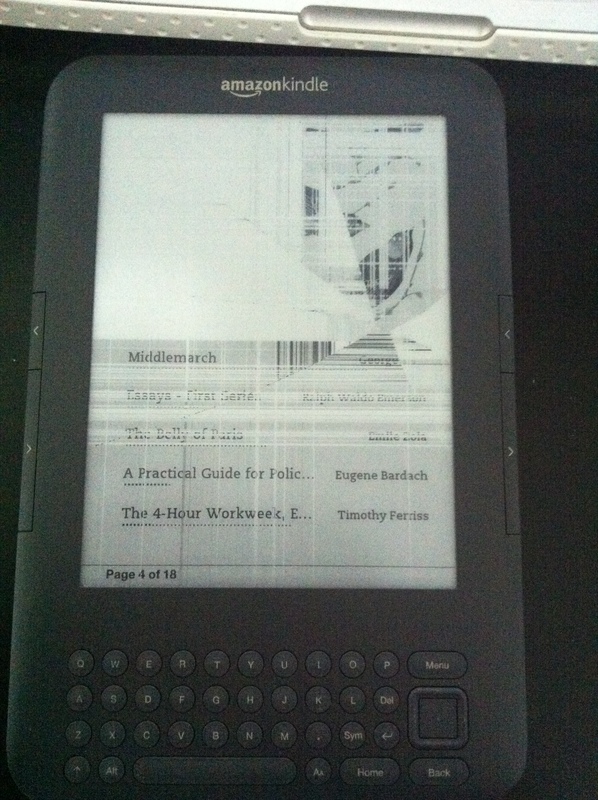 I love my kindle to death, so much so that the screen gave out. I had problems with it getting stuck and becoming unresponsive, but the next morning as I sat down to read my book the screen just didnt change. Rather it gave me this weird pixelated image and a web like mix of different screens after I moved the standby key several times. Suffice it to say for two weeks it was really rough because I had no clue what to do without my Kindle. Being short on cash I turned to Amazon in the hopes that they may be able to fix my Kindle, unfortunately, they didnt have my Kindle in supply and my warranty also expired. Amazon, however, offered to discount the purchase of another used Kindle model if so chose to purchase one. Unfortunately I actually hate the touch screen model that came after my Kindle Keyboard (3) model. Also even with the discount the cost of the new Kindle Paperwhite was not substantially out of range, so to purchase a model I don’t like made no sense. I thought I can get the Paperwhite within Amazon Primes two day shipment so my heart will once again be filled with joy! So I purchased the Paperwhite. Alas, the Paperwhite is on back order and I wouldnt get it until Oct. 24 (though a week later I got a email notification that the delivery date moved up to Oct. 17). Disenchanted with Amazon I turned to the internet to fume about my predicament. Thats when I stumbled on the video showing how to take apart the Kindle Keyboard. I thought to myself that if its that easy to disassemble then there must be a way to purchase the spare parts I need to make my best friend whole again. So I searched ebay for old broken, unwanted Kindles. But for some reason that search didnt go to far and tangentially I went to the youtube.com users account where I discovered they were a vendor that sold electronic parts. A few clicks later I was overjoyed to learn that they sold Kindle 3 screens and promptly, with the encouragement (okay, LOTS OF ENCOURAGEMENT from my spendthrift little sister), I bought the $49.95 screen which would arrive a week later. That same sister kept pressuring me to cancel my Paperwhite order, but I stubbornly refused so that I can cover my rear end just incase I botched up the transplant operation on my Kindle. Yesterday, however, I successfully took apart my Kindle 3, took out the defective screen, replaced it with the used-but-in-great-condition e-ink screen I bought…and, after an hour, ITS ALIVE AGAIN!!!! A super thanks to Powerbook Repair shop for putting together the “How To Repair Your Kindle 3” video! I am not bad at electronic thingies and not all afraid to take things apart and put them together again, but this was my Kindle and I didnt want to harm it any further. The video gave me the confidence and the guy on the video, his voice became my constant companion over three days as I watched and re-watched the video in order to make sure I memorized the process prior to actually performing it. Further, Powerbook Medic was freaking amazing in offering parts, the total cost of this procedure was a 1/3 of the cost of purchasing the new Paperwhite. For someone who’s on a tight budget like me, that means being able to get three weeks worth of groceries or going hungry so I could have a Kindle to read my e-books on. And once you fixed your Kindle, check out these book lists I posted- This is the list for 12th grade, 11th grade, for 10th grade and for 9th grade. hey have the same problem on my kindle. but i don’t know where to buy screen here in Saudi Arabia ? Man Kaye, thats a difficult one! So if your in Saudi, I guess i would try ebay, do you have access to it? One of my friends had earlier on suggested to buy a broken kindle for parts on there, however there are two problems i foresee- 1) you don’t know if the screen is the thing that is broken, which makes the purchase risky and 2) probably a bigger problem, is whether they will ship it internationally and conversely if the cost is worth the effort because it might turn out to be more then or equal to buying a new/refurbished kindle. Tell me if that works for you or not! I am sure other people internationally might be interested in this inquiry as well. I have no idea where to buy my screen I live in London. my keyboard kindle did the same as yours where do I find it????? Good question, i would try Ebay and also try amaazon as well! where to buy screen here in Mongolia? I buy 2 months ago from Best buy in DC. But now i m here. it s just half screen is frozen. Hey wombat5000! dude happy to hear that you got it going through frankensteining a working kindle, no shame in that! Totally worth it, sadly we live in a world that celebrates throwing away something broken to get something new. Thats just as unattainable is we can get when you consider two billion people in China and India are heading in that same direction, we got to change this attitude and rekindle this spirit our grandparents had, and tinkering is a good thing, who knows maybe you could design something AWESOME from having tinkered with your two kindles!